I won't go further with those lyrics as it'd give the wrong idea. It is Bill Rini's 1500th blog. And it is a good one that I'd suggest reading. Bill outlines his standards which have made him a go to blog for players and industry. Bill says he doesn't post for the sake of page hits and that's obvious in the standards his blog maintains. He also talks about the monetized value and doesn't really get it defined. 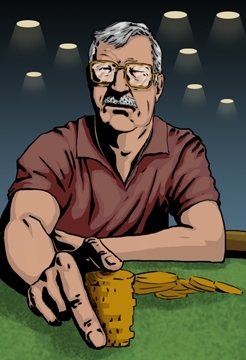 But, I'd have to say its done more than any other poker blog for income. For him though the blog wasn't a revenue generator but serendipitous in placing his credential out there at a formative time. He says page hits equate to post but he won't just do a post to keep the page hits coming. In the area of monetized blogs he may be the last of the breed. In fact, I'll say that he is. Without naming names, many “premier” blogs have moved from content to being SEO business plans. I'm not referring to the affiliate sites who provide content of varying quality. They've always been obvious in their intent. I am talking about those doing “link dumps” or rephrasing press releases or news items that are all over the place. That becomes a business plan rather than the originality that got them into their position. That's certainly their right but Rini has been able to do as well or better with his integrity completely intact. Thanks Bill, for allowing me to expect unique content that can hold my interest. I would be remiss if I didn't mention a blogger slash paid writer who's content maintains the highest standard in his free blogging that shows the old reasons we blog. Find him here. In the bellwether state of Ohio, voters would rather still have Bush as president than have Obama by a 50–42 margin. Thanks for the mention. Really appreciated! !